Lisa Jewell just goes from strength to strength as she serves up different scenarios with a whole cast of different characters in this her sixteenth novel and I for one was hooked from page one, where there is out and out darkness in the form of a body on a kitchen floor. The police are in attendance and an investigation is opened. First of all the author paints us a picture of perfection, a group of colourful houses perched on a hill, the type of house that Joey (Josephine) has always wanted to live in but that seemed unlikely after four years working in Ibiza, and now she’s home with her new husband Alfie in tow. Fortunately her older brother Jack and his pregnant wife Rebecca live in the cobalt coloured house in Melville Heights and her and Alfie had moved in while they sorted out where there life was going next. Lisa Jewell’s latter books have all had some level of darkness about them but this one hurtles headlong into the undeniable thriller territory. After listening to Joey describing her life to her mum at her grave, we are launched into a transcript of a police interview held at Bristol police station nearly three months past this point. A word of warning, keep your eye on the changing dates, which are easily signposted, because this book does hop backwards and forwards until the past catches up with the present. There are as in many of this author’s books a number of issues which are sensitively portrayed but with realism at its core rather than the reader getting the feeling that they’ve been used to bolster an otherwise flabby storyline. At the centre of this book is Tom Fitzwilliam, the head of the local school who is married to Nicola. They also live at Melville heights with their teenage son, Freddie. Joey quickly becomes infatuated with Tom and is watching him. Tom’s son Freddie was documenting the neighbourhood using his digital binoculars but more recently has been using his spy equipment to watch the teenage girls in the vicinity while down in Lower Melville Frances Tripp is convinced that there is a mass of people watching her, so she is watching everyone else. You might be able to tell from that very short synopsis, apart from a lot of watching, there are lots of characters in this book. And what characters they are, even the teenage girls are kept distinct by Lisa Jewell’s keen eye (and pen) for the little things that make each person unique. In short I found this latest novel absolutely gripping. I wanted to know who had been murdered, who would want to murder but most of all I wanted to truly understand this eclectic bunch of people who became my neighbours for the duration of the book. Of course it wasn’t that simple with impeccable timing we are drip-fed pieces of information, some of which are red-herrings, so that my opinion on the characters altered the more I learned about them all. I’ve said it before, and I will say it again here, if you haven’t read one of Lisa Jewell’s books you really should, she has a very easy to read style but that isn’t to say that they are superficial, in fact they are anything but! 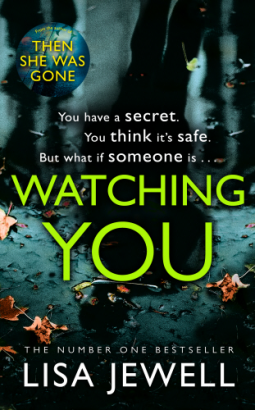 I’d like to thank the publisher Random House UK for allowing me to read a copy of Watching You and thank you to Lisa Jewell for such a gripping read. I loved this one too! Unlike you I haven’t read any of her earlier books – but I will now. Looking forward to reading this book. Great review. This does sound compelling, Cleo. I really like that vision of the houses. Such idyllic imagery, which, of course, just has to hide something. I can see how you like Jewell’s writing so well. Glad you enjoyed this. I’ve read two of her books and liked them very much. This one sounds just as good. That two time frames adds to the interest always for me. Fantastic review! Good to know she’s written another brilliant book! I have pre-ordered this one, and I don’t have a delivery date yet…sigh. I love her books, but I always have to WAIT for them. I guess that makes them even more valuable to me. I haven’t read Lisa Jewell yet but you’ve made me really curious! This sounds compelling. Ohhh I love the fact that everyone is ‘watching’ everyone else, it’s a nice set-up for murder! I am a huge fan of this author but as you say the set-up is fantastic in this one.